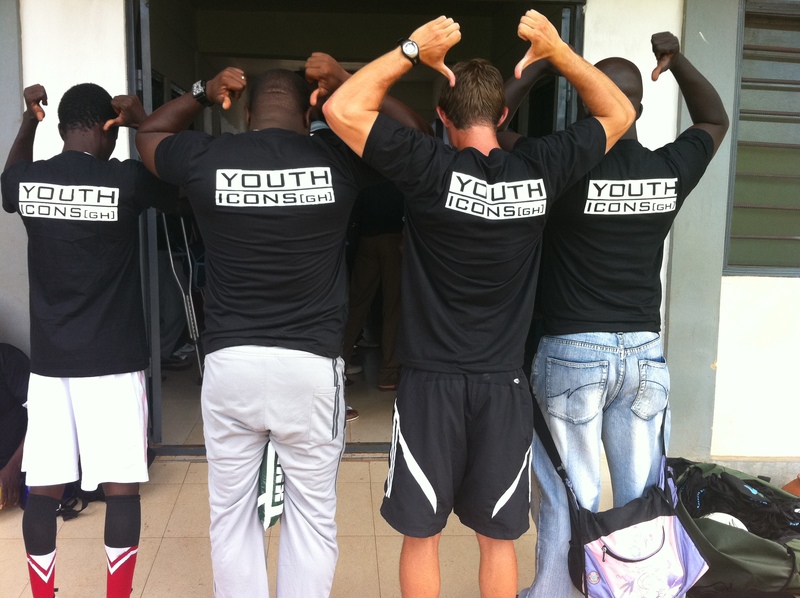 Top 3 moments in Ghana with our implementing partners Youth Icons and Standard Chartered Bank. Over dinner at the Majisi Court Hotel, Jaren, Nick, Emily, sometimes Nana and Trecity and I would discuss our top moments of the day both on and off the field. Every time the question came up, I was always asked first yet responded last. It is always hard to sort through the many moments of the day to decide which were the most noteworthy. In the last couple days with the Youth Icons Coaching for Sustainable Development program in Tamale, Ghana, Jaren and I were the two coaches in charge of bringing the program to an end, which included one day of training when the coaches coached the other coaches and the final day in which we presented each coach a certificate for their time, effort and dedication to our program. It was very rewarding to see the coaches take over the sessions and teach their fellow coaches the games that we had taught them the week before. Coaches formed groups of 2-4 and explained the activities using demonstrations, clear voices and lots of encouraging words. The coaches were able to take the games, execute them and then touch on the themes that each game addressed. By the end of the two weeks it was evident that among the group of 90 there were distinct leaders who could get the group moving in the right direction and who commanded a lot of respect from their fellow coaches. In continuing with our theme of discussing the day’s top three moments, I have chosen to discuss my top three moments/people in hopes of painting a better picture of our team’s experiences in Tamale. Nana Dwarka, founder and director of Youth Icons, was the driving force behind the success of the program. Nana made sure that everything ran smoothly and that everyone in the program was well taken care of. He himself participated in the program and found the HIV prevention games to be the most interesting. He showed enthusiasm for every theme we touched on even when he complained about his sore muscles the next morning. He helped our group of coaches better understand Ghana and was always encouraging more conversation about various topics. We all soon learned that if we left Nick and Nana in a room together they could talk hours on end, touching on topics across the board. Sir Alex Ferguson (Adam). When I wrote earlier about leaders that emerged in the group, I was referring to Sir Alex Ferguson, who was the only disabled coach that participated in the program and from the get-go made sure that we knew his disability would not limit his involvement in the program. He participated in almost every single exercise and always did so with a huge smile on his face. When it was time for him to coach, his voice was loud and clear and immediately garnered the respect of his fellow coaches. When we went to the local radio station to be interviewed, Nick was asked why he chose to include someone like Alex in his training program. For the group of CAC coaches we were a bit shocked that this question would arise particularly after all witnessing how competent Alex is as a coach. It was a great moment because it allowed Nick to explain that our program is about social inclusion because we all believe that soccer is a game for everyone. Attending a handful of trainings led by the coaches from the program showed me the power of the CAC curriculum. It was one thing to watch the coaches teach the other coaches at the end of the week, but it was another when the coaches actually took the activities to their own communities with their own teams. I participated in a training led by two of the male coaches for their youth female team. It was encouraging to see various female teams practicing and to see the support that many of the coaches had for the development of female soccer in their region. The coaches were thrilled to invite us to their trainings and when we arrived, instantly we were doing Circle of Friends, Manchester Street Soccer and many other CAC games. I could see firsthand that the coaches had understood the trainings and that the players were being challenged by the newly introduced games. We also watched a female youth team’s game that was being played on a field next to men’s game and it was wonderful to see that more people were watching the girls game and not only were people watching, but they were completely engaged in the play. For me, it was a very memorable moment. I am encouraged to know that the coaches can take the trainings and implement in their communities so that they will reach more and more players. Next: Our Year 1 Hat-Trick Initiative in Monrovia, Liberia.